To all our members, sponsors, partners, ambassadors, guides and volunteers. 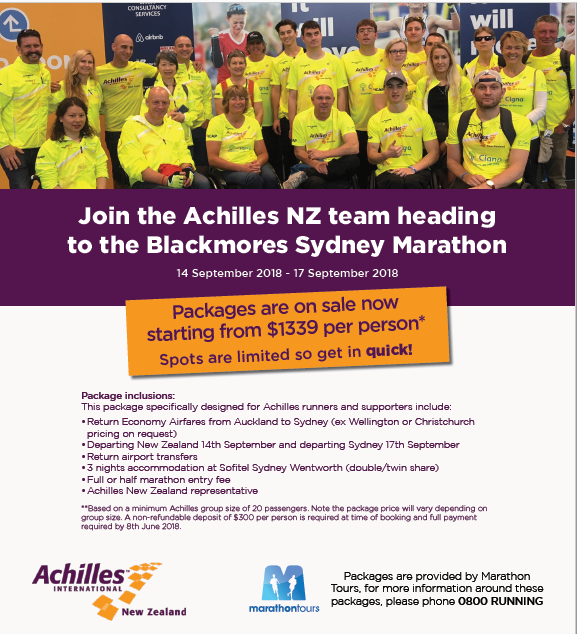 Welcome to the March edition of the Achilles NZ newsletter. Please see your local Chapter lead for more information concerning the nearest parkrun venue if you feel like participating in a 5km on a Saturday morning around New Zealand. The survey results are nearly finally completed and they with other bits of information will be sent out to all members during August. Thanks to all those who contributed to the survey and your views are very much appreciated by the Board. ⦁ Chapter Leads and the National Manager continued their monthly tele conference which is always held on the last Monday night of each month. Rosa Carter was also present from the Board and spoke about the Chapter Manual. Rosa ‘s main interest is in the strengthening and developing of Chapters and each month a different Board member will be involved to discuss and help the Chapter Leaders and members in their main interest. ⦁ The Strategic planning day was held and was very productive. The results of this will again be made available during the coming weeks. The next big event to test all your training is located in the wonderful city of Taupo. 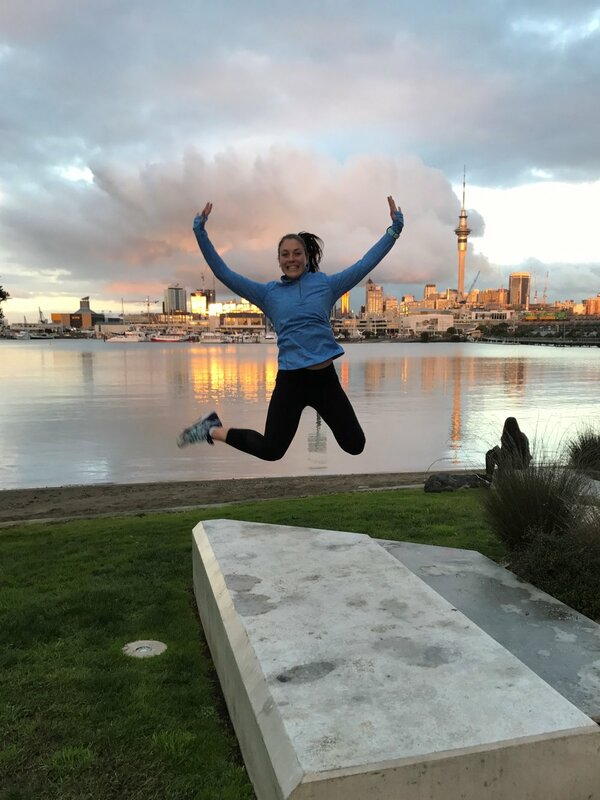 A special mention to Marion Fournier the administrator of the Run Taupo series who again has kindly offered a special deal to our athletes and guides. This year Faustinah Ndlovu is the Achilles NZ contact and leader for this event-for those that wish to make contact with her please email Faustinah at rotorua@achillesnewzealand.org. This year Taupo are celebrating 25 years – check out their history here. All finishers will receive our medal as well as the traditional Taupo “brown trout”. A great day for all those who ran, walked, jogged, guided, volunteered and supported those from Achilles along with 3000 others, who competed at the Wellington 10km, the Half Marathon and the Marathon on Sunday July 1. There were plenty of smiles to be seen despite the early start and rather wintry conditions, but everyone was up to the challenge of running, wheeling and walking. Kirsten, Keryn and Donna celebrating finishing the wellington Half Marathon. !! What do you love most about running with Achilles NZ? Meeting new people and running with a great organisation called Achilles NZ. If you could invite any four people to Dinner who would they be and why? What Achilles Chapter are you a part of? What Distance do you Run when you aren’t Guiding? I enjoy any distance - 10km, half and full marathon. However, a half marathon I am the most comfortable with and enjoy the most! What Event did you last Guide/Volunteer at? I am yet to guide at an actual event. My first will be the North Shore Marathon in just a few weeks. Why did you become a Volunteer/Guide for Achilles NZ? I had often seen the Achilles team at events, and had an interest in what they do, then Stephen Jenkins (Achilles athlete) contacted me about being a running guide so I jumped at it! What do you love most about being involved with Achilles NZ? I have loved working with people who inspire me, and I have also loved getting to know a whole bunch of different people - there is a real community feel to it. Barack Obama and Katherine Switzer - because I admire both of these people and would love the chance to have a conversation with them. Prince William and Kate Middleton - because I am one of those weird people who loves the Royals, and these two are my favourite! Do have a great August as you keep training for all the various events you are going to compete in and remember that products from Pure Sports Nutrition will be of great assistance to help get you through the training. We will be looking forward to hearing news from those competing in the events of the Taupo marathon on Saturday August 4 and thanks once more to all our guides and volunteers who put in so many hours for our members along with our sponsors and partners.